Not that long ago I wrote a piece about a UKIP supporter doing normal things. Currently, it’s one of the best read items on the blog for a while. That wasn’t the first UKIP post I have done. The one before that was about how the change of weather was because of some degenerate members of society. This one isn’t about that party but it is about the upcoming 2015 UK general election. If you’re in the UK and haven’t registered to vote. Why? You can easily sign up via parliament.uk. That website links to the various ways that you can make sure that your voice is heard on May 7, 2015. Just remember to register before April 20, 2015. Now, who am I going to vote for. This assumes that this party is on the ballot paper. It’s the Elder God Party. The movement has been running for a while in the US. At least from the early 1990s. 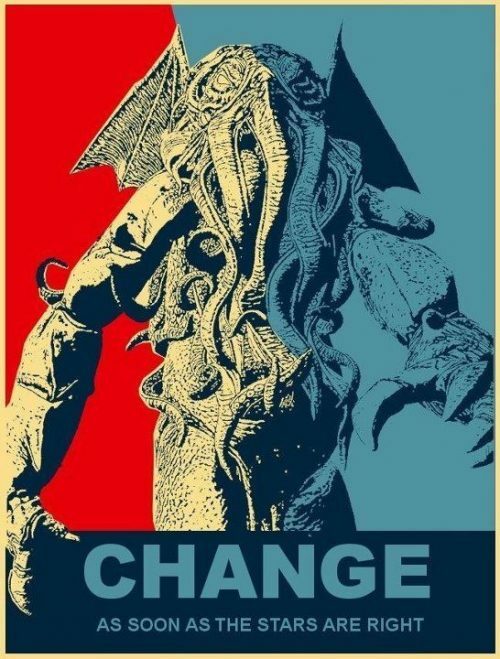 Vote Cthulhu for President was their clarion call for action. Unfortunately, or fortunately for mankind, he didn’t do well on the campaign trail. Eating, or sending insane, your voters wasn’t the best move to gain high office! I’m sure that this isn’t the best party to vote for but they haven’t lied to us about wanting to kill us and eat our remains. Just please don’t try and call Cthulhu by yourself as nasty things may occur. From needing a quick meal like below or, on the other end of the spectrum, sucking your sole from your dead corpse.